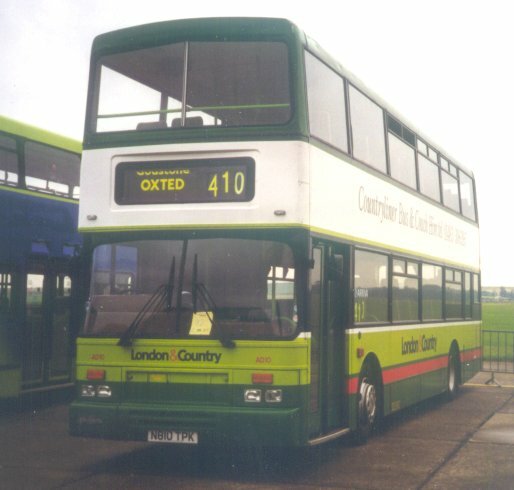 London Country bought ten of the large Dennis Arrows in spring 1996, ostensibly for busy trunk routes 405 (West Croydon - Crawley) and 727 (London Heathrow - Gatwick Airport, plus the 410 (Reigate-Oxted). AD1-8 were eighty seater buses, with shapely East Lancs bodywork, finished in London & Country green/green/red, which suited them well. AD1-6 went initially to Crawley, and AD7-8 went to Merstham. AD9-10 were fitted with dual purpose high-backed seating, losing a row of seats upstairs in the process. They had a broad white band between decks advertising the coaching arm of the company: Countryliner. These two went to Merstham also. AD10 looks good at Showbus 1998. But London & Country was taken over by the Cowie Group, who rebranded the company as part of the Arriva empire. 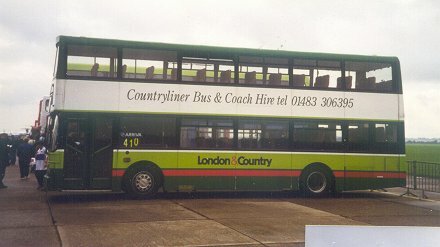 The Surrey and West Sussex operations did not provide the kinds of return on investment that Cowie demanded, and drastic economies were made in Arriva's characteristic style. The ten decent Arrows were shipped off to Heckmondwike in Yorkshire, and I often saw them in Leeds (unfortunately never getting a photo). They were replaced at London Country by ex-London Metrobuses, that a driver described to me as "clapped out bags of ****". After Arriva Yorkshire had had a chance to knock the stuffing out of them they were sold on to a variety of operators. Ian's Bus Stop Dominator/Arrow index. AD text. bus histories. photo references.